Bharwan bhindi (Okra, ladyfinger) is a spicy side dish and this recipe is prepared by filling the slit okra with a mix spice powder and then shallow frying them until perfection! 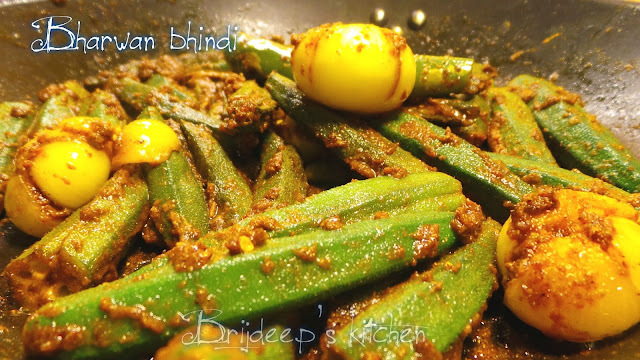 This style of okra will enlighten your taste buds with every bite. It serves as a wonderful side with a simple meal of dal, chappati and raita. This is how it's prepared in Punjabi households. 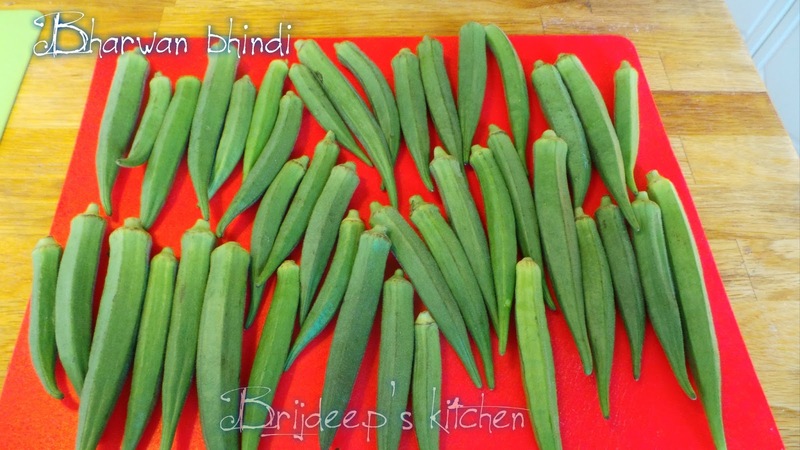 Thoroughly wash the bhindis and dry them completely. 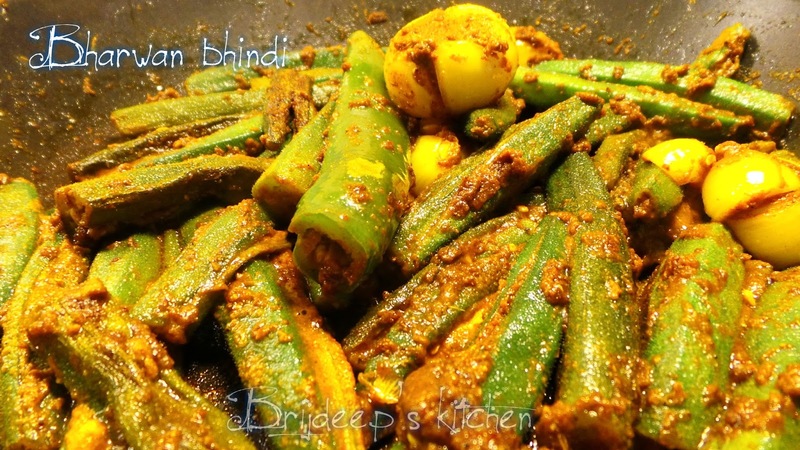 There should not be any moisture left in the bhindis because then it will not be cooked properly and they will get slimy while cooking. This is a very easy recipe yet this is the most important step yet time-consuming as you must dry each bhindi separately. 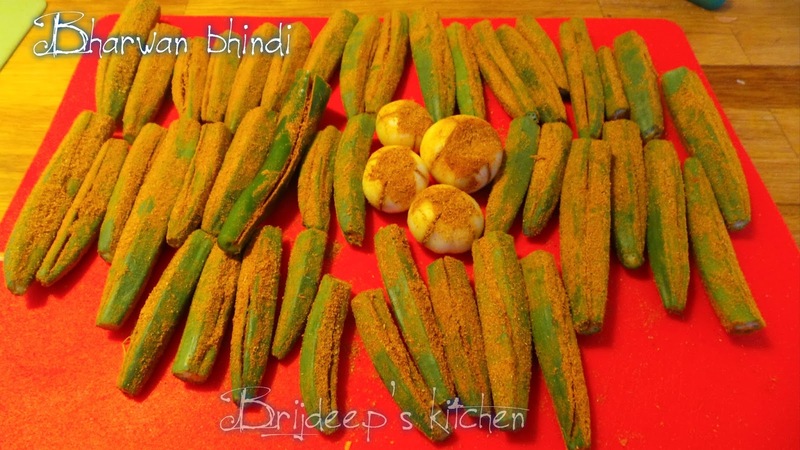 Tip: Wash the bhindi and spread on newspaper, leave overnight. They will dry themselves. Cook in the morning. 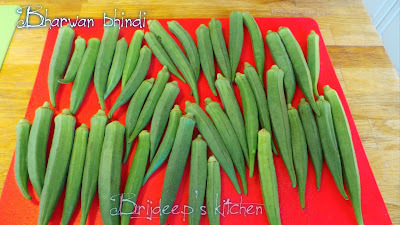 When ensured that all the bhindis are dry, cut off the tops and bottoms of all the bhindis very carefully and slit them from the middle, keeping them intact at one side (so that masala can be filled inside them). Keep them aside. Mix all the powdered spices: red chilli powder, turmeric powder, coriander powder, cumin powder, salt, garam masala and mango powder together in a bowl and mix well. Remember to keep everything dry. Fill this spice mix in all the bhindis individually with the help of a small spoon and keep it aside. Now peel the onions and slice them vertically and horizontally (as if cutting the onion in four equal parts) but keep them intact at the bottom. Stuff the onions with the spice masala completely. 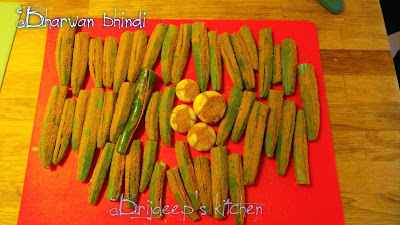 Now slit the green chilis also as done with the bhindis and fill in the remaining masala in them. If some masala is still left, don't throw it. Keep it aside. Add oil in a shallow cooking pan and let it heat on medium flame. 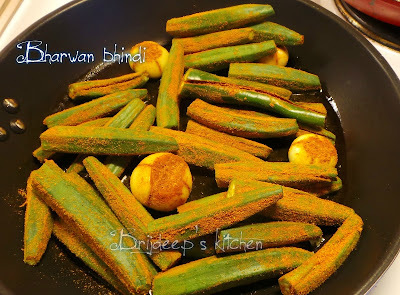 When hot, add cumin seeds and let them splutter. After 5 seconds, carefully keep the stuffed onions in the pan. Let it cook for about a minute, moving them about the pan carefully so as not to spill the masala outside. 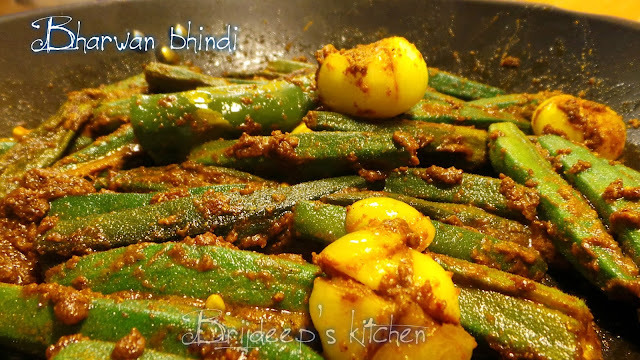 Now add all the stuffed bhindis to the pan along with the stuffed green chillis. Mix everything gently and let it cook till the onions get cooked, and the bhindis are tender and cooked. 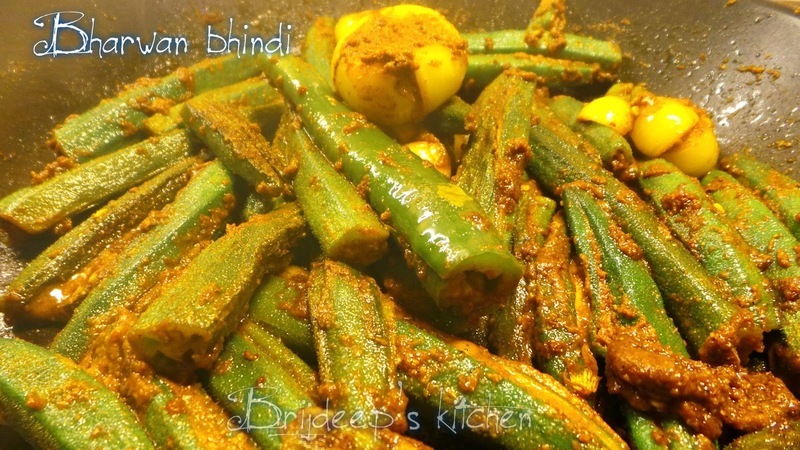 Don't cover the pan as covering will add water from the steam formed, and bhindi will turn sticky and slimy. When cooked, add the remaining masala (dry spices) if any is left. Mix well and turn off the flame. 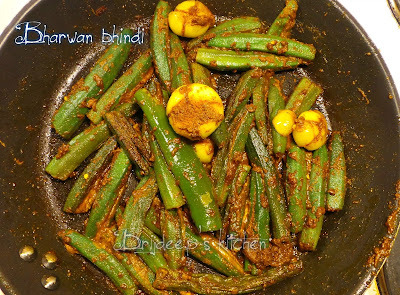 Serve hot with roti and raita to a complete lunch/dinner or as a side dish with other vegetable. Can you bake this in the oven ?